In the wake of the Japanese disaster, I am offering a reduced wedding photography package with 100% of the funds going to the Japan relief effort to the charity of your choice. In order to qualify, I must be available on your wedding date (in other words, I must not be "booked" for that day on another wedding). Please submit a 2-3 paragraph essay about how you and your fiance have positively affected the lives of others. The deadline to submit entries is Friday, April 15, 2011 at midnight. 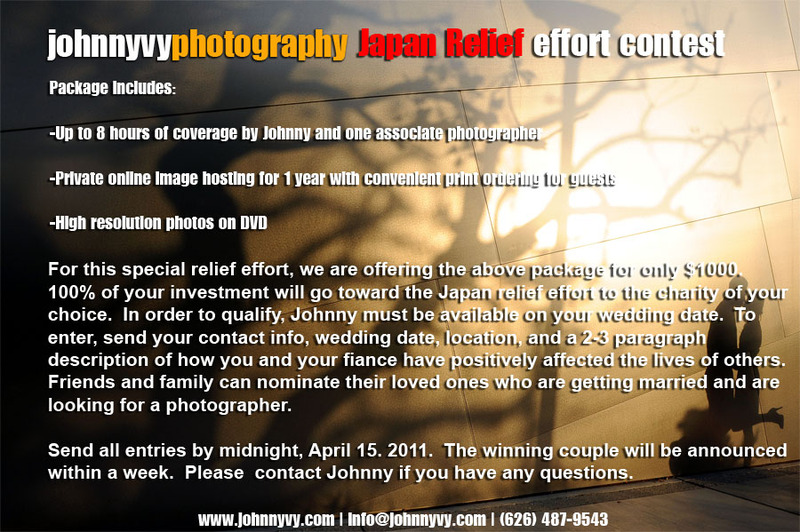 If you are getting married and haven't found a photographer, this is a great way to contribute to the relief effort. If you have friends / family getting married, you may nominate them for entry as well. Looking forward to reading your entries. The winning couple will be announced April 22, 2011. What a wonderful gesture Johnny!